Information - Benvenuti su miniatureintune! Each student indicates the choice of one A-class of 3 days and one B-class of two days on the registration form. Some classes are expected to fill quickly, so please indicate 1st , 2nd and 3rd choice for A-class as well as B-class. A waiting list will be maintained in case an opening in a class of higher priority becomes available. Classes take place from Monday at 10.00 til Friday 12th of July 2019 at 16.00. We end with an exhibition of our products on Friday at 16/17, and say goodbye to each other in Aud 1. If you arrive on Sunday, rooms are available from 17.00. Sunday dinner is served at 18.00. The rooms have to be vacated on Friday at 9.30, unless you have bought an extra overnight stay til Saturday. Those who stay Saturday should leave the room immediately after breakfast. Will be published closer to the date. The price for participation is EUR 831.00 which pays for classes, room and board from Monday 8th of July at 10.00 until Friday 12th of July at 17.00. Material fees vary and have to be paid directly to the teachers. The amount can be seen in the description of each class. However, the material fees can vary due to changes in currencies and shipping expenses for the materials to the school. Registration and reservation of a seat in the chosen classes is accepted at prepayment of EUR 135.00, which is not refundable if you cancel. Payment of the balance is due no later than 1st of March 2019. The money is to be transferred to Miniature i Tune's account in Mercer, as described on the registration form. All bank fees in connection with transferring the payment to Miniature i Tune is to be paid by the participant. If you cancel before February 28th 2019 you will be refunded the entire price except the prepaid EUR 135.00. After this date no refunds will be issued. Each teacher determines the minimum number of students per class. If the number of students does not meet the minimum amount by April 1st 2019, the class will be cancelled. It is each student's responsibility to closely follow the instructions from each teacher on the proper use of all tools during class. Miniature i Tune does not take any responsibility for any accidents. We recommend you buy an insurance policy in case you get sick or have an accident. Check with the authorities in your own Country. This year we would like to make a little exhibition in Auditorium 1. 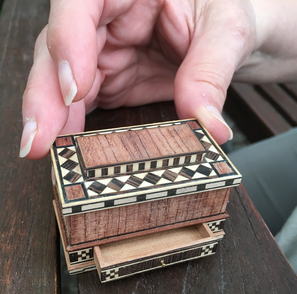 If you have one or two pieces of miniatures that you have created yourself here in Tune or at home, and would like to share them with us, please contact us at miniatureintune@gmail.com with a photo and a brief description. In the evening you have various options. Some workshops are open until 22.00. Please ask to your teacher. We will offer entertainment such as brief lectures , a sales fair and an exhibition. The sales fair on Tuesday evening showcases invited exhibitors and those of the students and teachers who want to sell something they have made themselves. If at the registration time you have something to sell, please send an email to miniatureintune@gmail.com If you decide to exhibit later, just bring it along. Wednesday evening we also exhibit the items we have just finished in the 3-day classes. Every night we may get together in "Kostalden" (The Cow barn), a large living room, and exchange experiences of the day and have refreshments at the self service bar. At the end of classes on Friday at 16.00 we hurry to the conference hall to make an exhibition of all of our products from the classes and to say goodbye to each other.